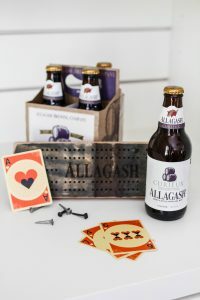 I partnered with Allagash to create this Father’s Day content for you. All opinions expressed here are my own. If you have a beer loving boyfriend, uncle, husband, brother or father with an upcoming birthday, father’s day or you want to give them an awesome just because gift… this is a super unique and fun idea! 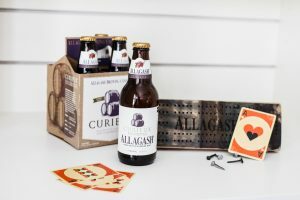 The Curieux beer from Allagash was first brewed in 2014. It’s available year round and super unique in taste. The beer is their Tripel which is aged in bourbon barrels for 7 weeks. Lastly they blend that with some fresh Tripel. What does this create? The Curieux beer is a rich golden ale with smooth notes of coconut, vanilla and a hint of bourbon. This beer one the Bronze Beer Cup in 2008! 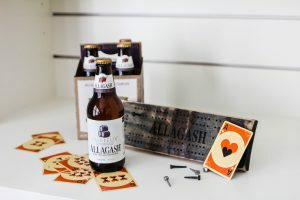 Each Curieux Cribbage Board is created from Jim Beam barrels that were used at Allagash Brewing Company to make Curieux. These barrels go from creating bourbon to beer and on to cribbage boards. Amazing how Allagash and the River Drive Lumber upcycle the wood. We are huge Allagash fans. I have even been to their brewery in Maine. If you get to Maine or live there you have to check out he brewery and go on a tour. We love their beer because they always come out with fun seasonal beer. Every beer I have had at Allagash I truly enjoy. Of course I love some more than others, however I never consider any of their beer to be offensive in taste as some craft beers can be. The White and Little Brett I think are my current favorites! Everyone I have met that works for Allagash at the brewery has been amazing. They are just wonderful people that are creative, kind and giving. Allagash allows employees to give ideas and try creating new beers. They are truly a big family and there is nothing more amazing to see in a company than that. Allagash is a company that gives back. You can learn a bit about it on their webpage. They support non profits all around, not just in Maine. They do however really try to stay active in the Maine community and support as many local people and organizations that positively impact the state of Maine. Such a great idea!! Love Allagash! Us too! It’s so fun, right? My husband is a big beer drinker! I’ve never heard of Allagash before though. Oh Jim would totally love this gift! What a great gift idea! For ME!! Haha! My husband doesn’t drink beer but I am a HUGE craft beer drinker! Next time we’re in Maine we’re totally going to Allagash! You have such great and creative gift ideas!! Girl, this looks so great! my hubs is *SUCH* a beer snob now! this is such a smart idea to get someone who is super hard to shop for!